﻿ TiVo Converter - Convert TiVo to MP4, MPEG, AVI, WMV, FLV, MOV etc. Home » video » How to Convert TiVo to MP4, MPEG, AVI, WMV, FLV, MOV etc with TiVo Converter for Playing? TiVo Video Converter - How to Easily Convert TiVo Videos to MP4, MPEG, AVI for Playing? TiVo, the professional digital video recorder, provides us with marvelous videos, TV shows, and movies. However, we often meet the issue that TiVo videos cannot be played on Windows, Mac, media players or be transferred to portable devices or be edited in video editing tools. It is quite hard to upload TiVo videos to YouTube or burn TiVo files to DVDs. As a matter of fact, all these issues are caused by the file format compatibility. To solve the compatibility and freely enjoy TiVo videos, we had better to convert TiVo videos to more popular video and audio formats like convert TiVo to MP4, convert TiVo to MPEG, convert TiVo to AVI, convert TiVo to MOV, convert TiVo to FLV, convert TiVo to MKV, convert TiVo to VOB, convert TiVo to MP3 and more. The following article will introduce a step by step guide on how to convert TiVo videos on Windows and Mac to play TiVo files in iTunes, VLC, XboX, BlackBerry, PS3, upload TiVo videos to YouTube, burn TiVo files to DVD or edit TiVo files in iMovie and more with a professional TiVo Converter and TiVo Player. 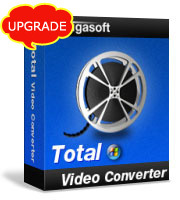 Bigasoft Total Video Converter is a specially designed TiVo Converter that can help convert TiVo files to various video and audio formats on Windows and Mac with HD quality and fast speed. TiVo Video Converter is also a nice TiVo Player that can help play all your TiVo movies, TV series and videos. 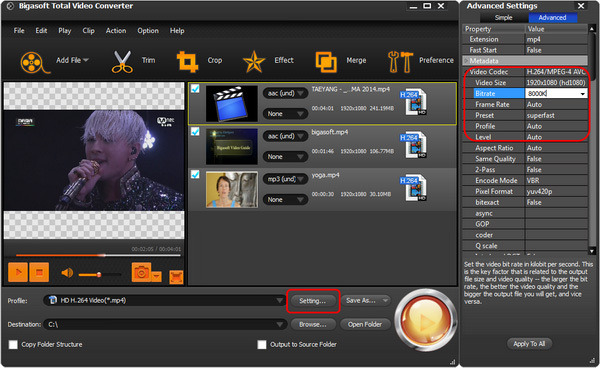 Bigasoft TiVo Converter can also do some video and audio editing functions. TiVo Video Editor can merge TiVo files together, trim TiVo video clips, split TiVo files into chapters, adjust the video screen of TiVo files, remove black bars from TiVo files, add watermarks to TiVo files, add subtitles to TiVo files, rotate TiVo files, improve video quality, boost sound volume, choose the audio channel as Mono, Stereo, 6 channel, compress TiVo files and more. Why You Choose TiVo Video Converter? TiVo iTunes, VLC - Convert TiVo to MP4 to play TiVo videos in iTunes, VLC, Apple TV, QuickTime, Windows Media Player and more. TiVo XboX, BlackBerry, PS3: Convert TiVo to MPEG, AIV or MP4 to transfer TiVo files to XboX, BlackBerry, PS3, PSP, iPad, iPad mini, iPod, iPhone, Android, Samsung Galaxy, Google Nexus, Microsoft Surface, Zune, Pocket PC, Creative Zen, Xbox, Archos and so on. TiVo YouTube - Convert TiVo to FLV, MP4 or AVI to upload TiVo videos to video sharing sites like YouTube, Facebook, eHow, Vimeo, Vimeo, BBC, Bing, Yahoo and more. TiVo DVD - Convert TiVo to DivX to burn TiVo videos into DVDs or play TiVo files in DVD Players. 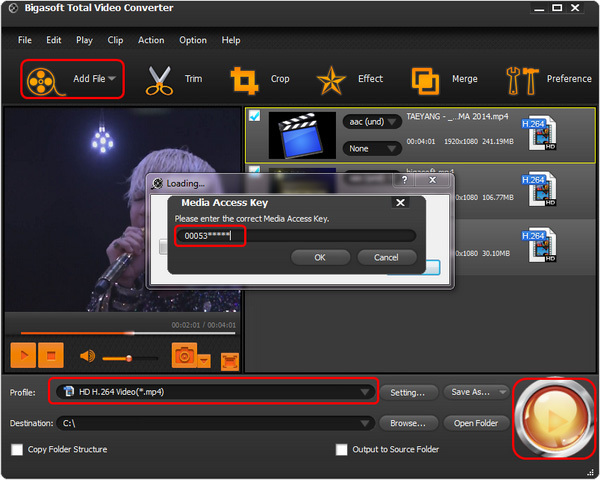 Convert TiVo files to MOV, MPEG or MP4 to import TiVo to Windows Movie Maker, iMovie, Adobe Premiere, Final Cut Express, Final Cut Pro, Sony Vegas, etc for editing. Convert TiVo to other popular video and audio formats including convert TiVo to MKV, VOB, Apple ProRes MOV, WebM, H.264, 3GP, Xvid, RM, F4V, VP8, AVCHD videos and more or convert TiVo files to MP3, WAV AAC, AC3, WMA, FLAC, OGG, AIFF, RU and etc. TiVo Converter for Windows can work with all Windows systems including Windows 8, Windows 7, Windows XP, Windows Vista, and Windows 2000. TiVo Converter for Mac is compatible with Mac OS X 10.9 (Mavericks), 10.8(OS X Mountain Lion), 10.7(OS X Lion), 10.6(Snow Leopard), 10.5(Leopard), Mac OS X 10.4(Tiger). How to Convert TiVo Videos for Playing on Windows and Mac? The following article will introduce a useful and simple guide on how to convert TiVo to MP4, MPEG, AVI, WMV, FLV, MOV, MP3 and more on Windows and Mac to play TiVo files in iTunes, VLC and other media players or upload TiVo videos to YouTube, burn TiVo files to DVD or edit TiVo files in video editing software with a professional TiVo Converter and TiVo Player. Free download the professional TiVo Video Converter - Bigasoft Total Video Converter (For Windows, For Mac), run the software on your computer. Click "Add File" button to import the TiVo files to the software. You can also drag and drop TiVo videos to the interface of the software. Then the following window will pop up, after fill the Media Access Key in, your TiVo Videos are loaded successfully. Step 2 Set the Profile as MP4, MPEG, AVI, WMV, FLV, MOV, MP3 etc. To convert TiVo to MP4, go to the "Profile" drop down button and set the video format as MP4 from "General Video" category. To convert TiVo to MPEG, go to the "Profile" drop down button and set the video format as MPEG from "General Video" category. To convert TiVo to AVI, go to the "Profile" drop down button and set the video format as AVI from "General Video" category. To upload TiVo to YouTube, choose the output format as FLV from "General Video" category. To burn TiVo to DVD, set the output format as DivX in "General Video" list. To convert TiVo to XboX, BlackBerry, PS3, go to the "Profile" drop down button and set the video format from "XboX", "BlackBerry", and "PS3" list. To convert TiVo to MP3, WAV, WMA and other audio formats, choose the desired audio formats from "General Audio" list. Go to the "Trim" window to cut off TiVo videos. Go to the "Crop" window to TiVo videos or adjust TiVo videos screen. 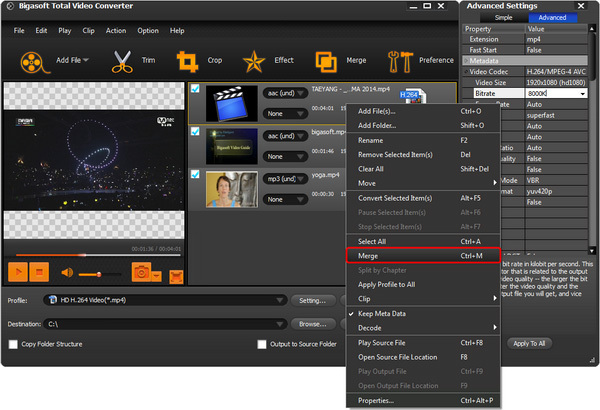 Go to the "Effect" window to add or remove watermark, add subtitles to TiVo videos, rotate TiVo videos and more. Go to the "Settings..." button to increase TiVo videos quality, increase TiVo videos sound volume, adjust TiVo audio channel or codec, compress TiVo videos and more. You can also merge TiVo videos together and split TiVo videos on the interface of TiVo Converter. Click the "Convert" button to start converting TiVo videos. TiVo Converter is the most professional TiVo Video Converter which enables to convert TiVo videos on Windows and Mac. Free download the powerful TiVo Video Converter as well as TiVo Player to play TiVo files with unlimited fun.